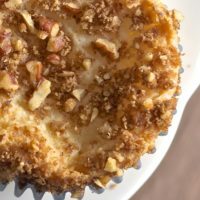 I have to confess that those big, sweet, bakery-style muffins aren’t my favorite. I do love muffins, but I prefer them on the subtle end of the sweet spectrum. 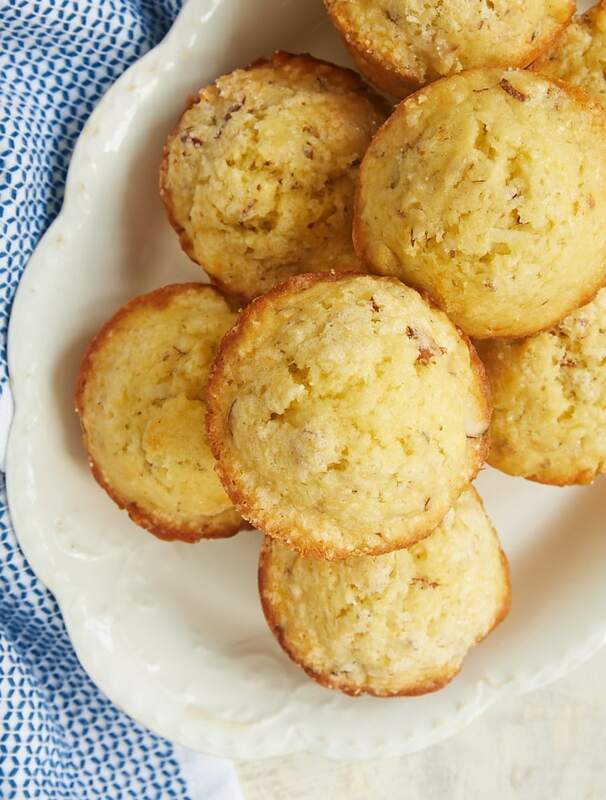 These Coconut Almond Muffins fit the bill perfectly. They’re just sweet enough for a little morning treat. 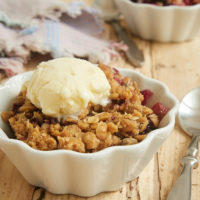 Plus, the combination of crunchy almonds and sweet coconut is irresistible! 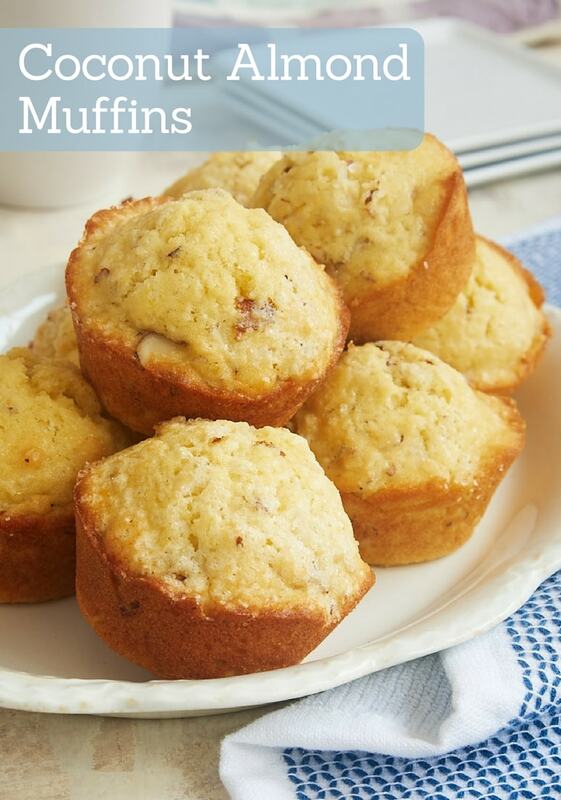 Maybe best of all, you can have these muffins mixed and in the oven in a matter of minutes. You won’t even need to get out your mixer! I like to measure the milk in a larger than necessary measuring cup so I can mix the other wet ingredients in the same cup. I’m all for keeping the dirty bowl count to a minimum and cutting down on clean-up time. 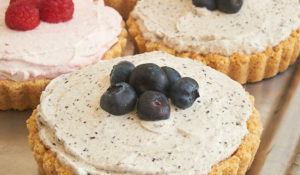 How wonderful to have a batch of homemade muffins without a lot of fuss and mess! 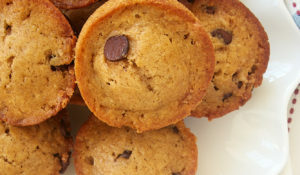 These muffins bake up so nice and tall. They aren’t dainty, crumbly muffins. No, they’re nicely dense and sturdy, making them a great grab-and-go treat. 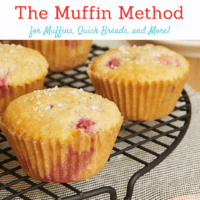 I love the lightly sweet flavor of these muffins, but I know that some of you may want them a tad sweeter. 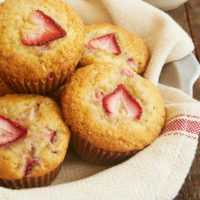 If you’d like to add just a little more sweetness, try sprinkling a pinch of coarse sugar on top of the muffins before baking them. 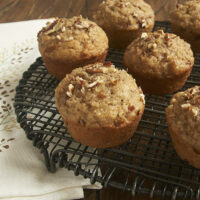 These lovely muffins are just the thing for a quick breakfast treat or afternoon snack. They mix up so quickly and easily that they’re a great pick for a sweet treat on a lazy weekend. They’ll stay fresh in an airtight container for a few days. Enjoy them at room temperature, or warm them slightly if you prefer. 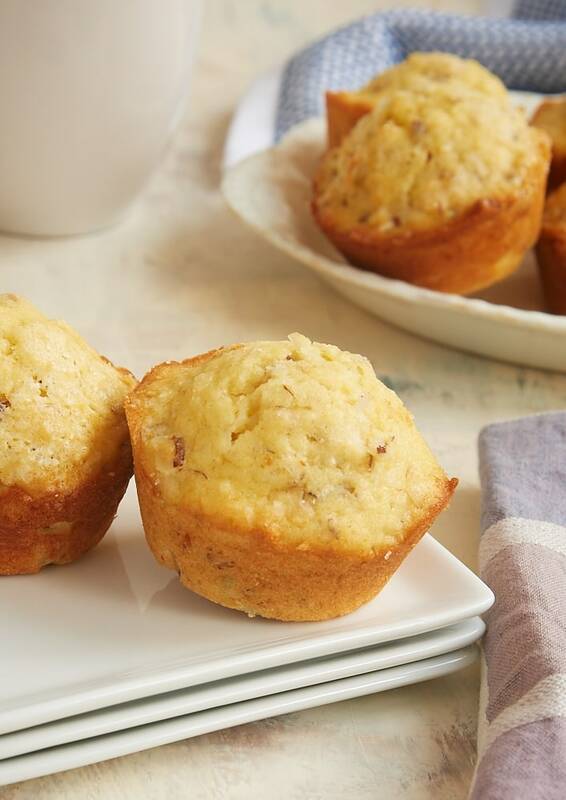 Coconut Almond Muffins combine wonderful flavors in a lightly sweet muffin. 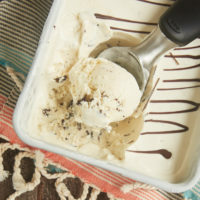 Perfect for a morning treat or an afternoon snack! Preheat oven to 400°F. Grease or line 12 standard-size muffin cups. Whisk together the flour, sugar, baking powder, and salt. Make a well in the center of the mixture. Set aside. In a separate bowl, combine the butter, milk, eggs, vanilla, and almond extract. Add to the well in the flour mixture, and mix just until combined. Stir in the coconut and almonds. 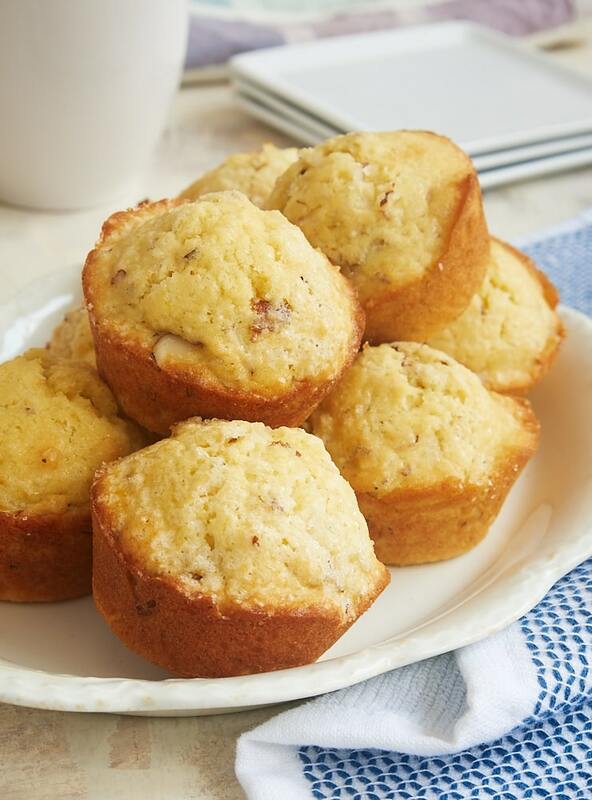 Divide the dough among the prepared muffin cups, using 3 to 4 tablespoons of batter per cup. 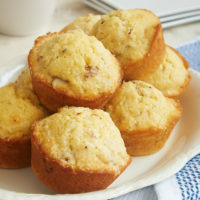 Bake 14 to 18 minutes, or until the muffins are golden brown and a pick inserted into the center comes out clean. Cool in the pan for about 10 minutes. Then transfer the muffins to a wire rack to cool completely. 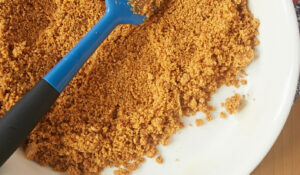 Have you tried substituting almond flour for some of the AP flour? Think I might want to try that. I haven’t, but that’s a great idea! I’d probably substitute for about 1/2 cup. These sound awesome! I think the office crew would like these for breakfast.